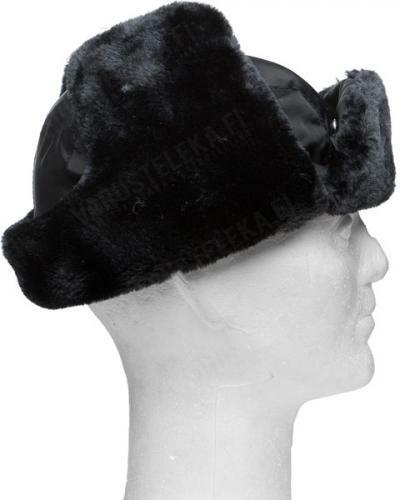 A civilian copy of the US issue fur hat, all black. 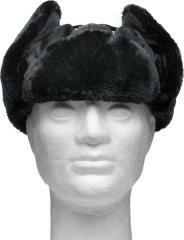 Nice, warm and lacks the boxy shape of most military fur hats, so people won't mistake you for a communist. The back and sides can be folded up for casual use or lowered for less pleasing conditions. The flaps lock both up and down with a plastic buckle and the ears and forehead have extra protection. 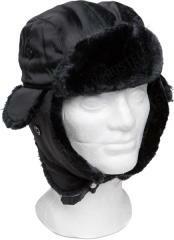 Made from polyester and fake fur, which is also polyester. Weighs virtually nothing and takes up very little space for a fur hat. The sizing is forgiving; a Medium sized hat will fit a 58 cm head just fine. Hyvä arvollisen näköinen hattu papille talvihautajaisiin. Hinta-laatusuhde on kohdallaan, mutta jos myynnissä olisi musta M05-mallin karvalakki, ostaisin heti! Tämän hatun kiristyslenksu ei ole niin jämy kuin toivoisin, eikä tässä ole lämmittäviä vemppaläppiä poistavassa viimaa korvista kun olet haudan partaalla siunaamassa vainajaa haudan lepoon. Muutoin kyseessä on asiansa hyvin ajava päähine.